This tutorial describes an approach to check if Windows systems are being properly patched. This is important in particular if you have servers in larger numbers, and you need to evaluate their compliance and risk status for your company. The typical existing solutions are running reports through Windows Update Servers (WSUS), or running scripts against the registry to list and compare the applied patches against a baseline (Security scanners like Foundstone or Nessus do just that). The last approach is certainly the most accurate, but also the most intensive way. With Microsoft releasing patches bi-weekly, these patch lists are growing huge over time. Even when they finally collapse into a service pack after many month's, patch lists are frequently changing and confusing. It is less accurate then the method of comparison against a patch baseline list. For example, it is impossible to tell directly and independendly if a particular patch has been applied. It does not tell if there are patch-overriding settings that suppress a particular patch installation. The future will show if this alternative method is sufficient and practical enough. The method currently works well with our Linux servers, where the patch-check connects to the online patch service, returning the list of outstanding patches for a particular system. Our Linux Vendors (Novell SuSE Linux Enterprise Server) patch release cycle is even more frequent then Microsoft, with patches being released on a almost daily basis. With a active Nagios notification being send to our admins, I found the patching being done much faster and pro-active. Nobody want's their servers being listed in status warning for too long. With patch reminders being send out until the patching is complete, administrators cannot 'forget' the patch task in their daily struggle of shifting priorities between server maintenance and project work. First, we need to have a program that determines the current patch status. Microsofts Windows Scripting Host is universally available, we can use VBscript to write the check program win_update_trapsend.vbs. First we edit the top of the script to set our SNMP trap destination IP. Running it without further options, Windows scripting runs in interactive mode, opening a output window. We want to suppress that window and redirect any output into a local logfile. I created a batch file called win_update_trapsend.bat so I do not need to re-type the commandline options when I want to run it by hand. Finally, we need to find a good home directory for our script, often admins already have such a script home for their ops scripts. If not, I tend to use C:\update-monitor. We are using SNMP to monitor Windows severs and SNMP is our central monitoring protocol used across all systems. In Linux, we have the extend function in UCD NET-SNMP that allows to run scripts remotely and receive the output through SNMP. Unfortunately, the SNMP service shipping with Windows is limited: incapable of SNMPv3, no extend. As a result, we face the dilemma how to initiate the check and how to transport our monitoring result back to Nagios. One solution is to add a service such as NRPE-NT, which is exactly made for that purpose. But should we do that just for one single script? Repeat after me: "I dont want another daemon! I don't want another daemon!..." :-) In a enterprise with hundreds of servers, it makes a difference of getting a small client program rolled out vs. going through all the required testing of implementing another service. I tested sucessfully TrapGen from Network Computing Technologies, Inc., a small 136KB binary that can send custom SNMP traps from Windows systems. 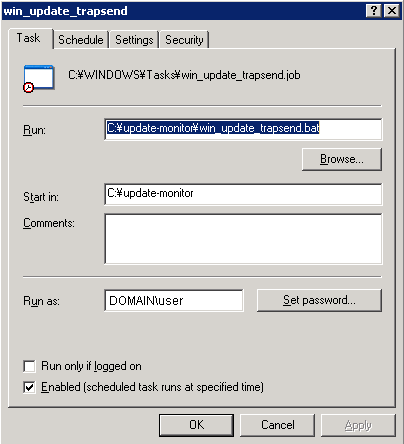 Together with the setup of a SNMP trap daemon, plus the passive service configuration in Nagios, we receive Windows update check results that are launched daily through the Windows scheduler. The client setup is easy on the windows system and also easy on the Nagios side, because we can leverage the existing SNMP trap implementation of our Windows Reboot Monitoring. We just add a new trap handler definition to '/etc/snmp/snmptrapd.conf' and update the send_trap_data.pl script. This script is responsible for processing the received SNMP trap data, parsing it into a Nagios event and submitting it to Nagios as a passive check result. This might require some debugging, since trap OID's could be translated differently - depending on the MIB's loaded by the trap daemon. The script uses trap OID strings to separate different trap types to match them up with their respective Nagios service group. #    configuration file for configuring the ucd-snmp snmptrapd agent. # next , the trap handlers. Passive checks have disadvantages: We cannot force a re-check of the Service from Nagios. If we want to update the Nagios status (Manager after patching: "Make it green! "), we need to either wait for the next scheduled check to kick in, or we need to run the check script on the Windows client by hand. A second disadvantage is that a system's monitoring configuration can break and it is not noticed. Then a passive check will not receive any new data. Fortunately, we can visualize this in Nagios using the 'freshness' parameters together with the check_command definition for 'stale' results (see no-patch-report in the next section). Here, one important item is the service description name. It must match the name configured in send_trap_data.pl. Otherwise, Nagios cannot relate the event to any existing service for processing it. check_command                 no-patch-report ; runs if service is "stale"
# This will always return "OK" but tells us no patch report came in that day. command_line $USER1$/check_dummy 0 "Daily patch check result not reported!" With most servers being set to use WSUS, Windows patches are WSUS approved and then deployed on a fixed schedule. That means the patch check could *always* return OK, because patches become only visible to the system shortly before the actual patching. Also, we depend fully on the WSUS administrator to determine which patches are applicable. The solution? For the time of our patch check, we switch from WSUS to the *official* Windows Online update service and back to WSUS after our check. It is quite an effort (registry key changes, proxy settings, etc), but the only way for an independend check. This code is in development/testing, your comments highly welcome. Check if the data is correctly associated with a Nagios service and hostname. Most of these troubleshooting steps are also described (in more detail) here Windows Reboot Monitoring. The older versions v1.1 and v1.0, just in case. A local copy of TrapGen version 2.8 is saved here.